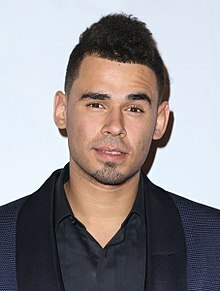 Nick van de Wall (Dutch: [ˈnɪk fɑn də ˈʋɑl]; born September 9, 1987), professionally known as Afrojack, is a Dutch DJ, music programmer, record producer and remixer from Spijkenisse. In 2007, he founded the record label Wall Recordings; his debut album Forget the World was released in 2014. Afrojack regularly features as one of the ten best artists in the Top 100 DJs published by DJ Mag. He is also the CEO of LDH Europe. I always loved cars. I used to play 'Need for Speed' all the time... any racing game. I'm a DJ, but I'm also a ridiculously high-grossing musician due to doing productions. I think the most important thing about dance music is the connection. If you put 80,000 people together, no one knows each other, and once the music starts, everyone loves each other. That doesn't happen with a lot of genres. If you go to a hip-hop club, it's not like when one songs comes on that everyone suddenly loves each other. Maybe one day there will finally be an education for electronic music. Most music that comes out of Holland is basically the harder part of dance music - hip-hop, drum'n'bass. Every song, every form of art, clothing, shoes, it has to be special. When I was a baby, my mom used to have a dance school, and she used to teach classes there. We didn't have money for a babysitter, so she always brought me with her to the dancing school. Back then, I was already watching and listening to Michael Jackson for a long time. Cars for me are like a piece of art. When I was growing up, I said to my ex-girlfriend, 'I will not be successful until everyone in Holland knows my name.' And it worked. I actually did a remix for Katy Perry, and her management didn't respond. The only person you need to be credible to is yourself. When you stand in front of the mirror and nobody is watching, are you happy with yourself? If you never lie to yourself, you'll always be happy with yourself, and eventually the person you wake up with and the person you go to sleep with is yourself. One of the reasons why my album is called 'Forget the World' is because when you listen to the world, you make stupid mistakes. You're going to be way happier doing what you actually love and finding other people that love the same thing than doing something that other people love so you're just cooler and you have cool friends. My debut album, 'Forget the World,' is all about not listening to the negativity around you and to continue to do what you love, no matter what people think. I love what I do. Dance music is my passion, my life. There is no greater feeling than being one with my fans, partying to the music we love. I was thinking about working with Lady Gaga, not 'Born This Way' but more her old stuff that she did with RedOne from her first album. I think that would be really fun - a cool combination. People always say, 'How is it to be so successful?' I'm not successful yet. Richard Branson is successful. That's successful. Michael Jackson was successful. U2 was successful. I'm just a guy, doing okay. But I'm a happy guy doing okay. When I had my first gig, I was 18 in January in 2007. My first gig that I got paid, I was playing for 10 people in a 250 people capacity venue. The promoter wanted to book me because he liked my music. I played a couple of songs that made people dance. To me, that rush has always stayed the same. I was in school - I was a good learner; if I wanted to get something done, I could get it done. I was lazy, though. I was always, like, sort of an outcast. And when I got home, I was always doing music, but when I was doing music, no one was there to judge it, you know? It was just me in my bedroom. It gave me freedom and made me happy. I want to make an album my grandma and my fans are going to like. I want to make my grandma understand a drop and make club fans understand a song. When you're walking down the street or in the car just listening to the radio, and you're, like, 'Oh, that's my song.' You want to say, 'Hey Mom!' That never changes. The only way you can be happy is if you be completely yourself. You have to be you. Don't be what you think you should be. I studied psychology for a couple of years as a personal hobby, so you start learning about people and listening to your intuition, like when you you're feeling that people are not being entirely straight with you. Holland is a really small country, but with a very strong club and festival scene. Dance music has been huge in Holland since the late eighties. So there were a lot of opportunities for producers and DJs to release records and play live. I even have shoes that don't fit. They're just so cool, I wanted to have them. At a festival, a lot of people came to see other artists, so you have to put on a signature set and performance: 'This is what I do, this is why I'm here.' At solo gigs, I'm a DJ - I'll play two-and-a-half hours, and not just my own music, also my favorite songs by other artists. I have a living room full of clothes. It's insane. The coolest things in life are things that you have not done before. That's the key to life: new things always. I'm a producer for fun. I'm not a professional schooled musician or anything.